The last few weeks have been busy. 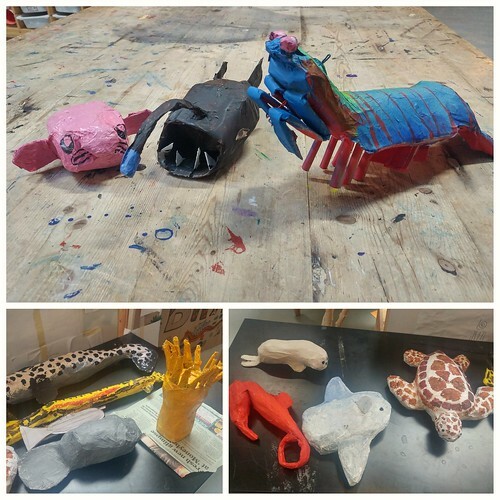 We’ve explored the stories of the Chinese immigrants in Chinatown, researched sea creatures, made paper mache models, prepared declarations, and even made lunch for the entire school. Now it’s time to fully launch into projects. 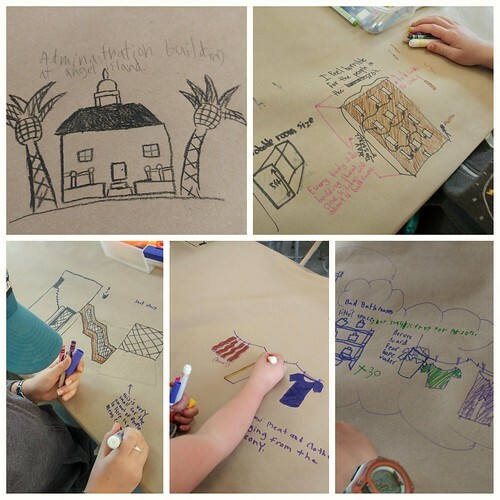 This time around we have a wonderful collection of projects that truly speak to each Teal Bander and their interests. Below is their proposed project introduction from their declarations. It turns out that the limiting factor of algae growth is the amount of iron in the water. In combination with researching how much oxygen algae produces per square inch and calculate the amount of algae that would need to be grown to counter the carbon footprint produced by the average family, I would like to try increasing the amount of iron in the water to figure out how much iron would need to be dumped into the ocean to counter the family’s carbon footprint production. This could be used in huge quantities to stop, or at least slow down, global warming. Growing algae in different solutions such as different salinities and pHs to observe possible variation in growth rate. Growing algae in polluted environments to observe what effect global warming/pollution will have on algae growth in the future. Try growing Euglena gracilis, a type of algae, under a heat lamp. Euglena gracilis is a type of algae that, when grown in temperature from 31 to 35 c, loses it’s color and turns white. Along with my experiments, I want to write a small research paper on sea anemones, specifically the giant green anemone, and their symbiotic relationship with algae. Piper: For my project, I am proposing to learn about the ways people and organizations help to save sea turtles. I will write a research paper on sea turtles and the reasons they need saving and the ways people work to save them. I will also find an organization to support. I will make sea creature stuffed animals to sell and raise money for the organization. I will include a little “bio” about each type of sea creature with them. Patrick: I want to write an online fiction on the hosting site RoyalRoadL. I found it a while back in January and have been hooked on it ever since with about 24 open fictions that I am keeping up on. I’ve wanted to write one of my own for about two weeks now and believe my project time will be well spent doing something I’m passionate about. My fiction will connect with the By Sea Arc because I will be incorporating research around hydraulics, fire pistons, and sailing cultures such as the Vikings. I won’t really need anything for this project, just time, wi-fi, a computer and my imagination. Overall, I think this would teach me to be prepared for deadlines and how to focus better on what I’m supposed to be doing. Jonah: For my project, I am proposing to build a mini hydropower plant. This hydropower plant will use water to power a light bulb. Water will travel through a canal and over a waterwheel to create the power. As this is my first project, I want to take on something that won’t be too difficult, but is still fun, so I can take my time learning about the project phase. Huxley is helping me with the understanding of the energy flow. I think the hardest part about my project will be getting power from the generator to light the light bulb. I will also be researching hydropower, such as the positives and negatives of its use and creation. Jared: My proposed project is on dolphin communication and echolocation. Dolphins are seen as highly intelligent and appear to have a language of their own that consists of whistles and clicks. I am interested in researching more about how they communicate with one another and their communication process in general, both through sounds and body language. Along with communicating, they use their clicks to help them echolocate. I will be writing a research paper and creating a short documentary on dolphin communication and echolocation. Huxley: Instantly inflatable devices for drowning prevention have been released out into the market, however, their compressed CO2 system does not allow them to be larger scale than a personal device such as a bracelet that inflates to the size of a small balloon. Super-corroding alloys are made by combining a noble metal and a highly corrosive metal. When in contact with water, the noble metal forces the corrosive metal to corrode at an extremely accelerated rate, forming corrosive metal hydroxide or oxide, and a gigantic amount of H2. I want to create a instantly inflatable flotation device using supercoroding alloys, as proof of concept that this process would be able to produce a larger scale flotation device. anatomical drawings and draw diagrams of barnacles. As there are over 1,400 different species of barnacles, I have decided to do my research on two specific barnacles. The first is the Acorn Barnacle which is the most common and the second is the Buoy Barnacles. Tracking an object from where it was made to Brightworks. Interviewing experts in manufacturing and shipping to understand the manufacturing and delivery process. Research how goods are packaged, how efficient it is to ship them from point A to point B by cargo ship, as well as how truck and train transportation affects the cost, monetarily and environmentally. Make a model of a shipping container that, in an emergency, will float so that there will not be so many shipping containers at the bottom of the ocean where they scrape the hulls of boats and hurt the ecosystems. These next seven weeks will be another wonderful adventure through the Expression Phase. 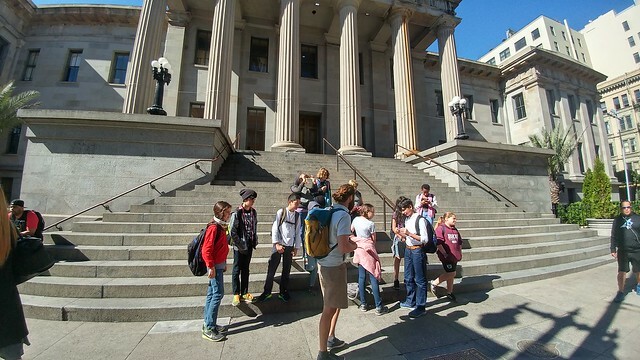 The beginning of our journey down the Barbary Coast Trail, The Granite Lady, the Old Mint. Recording our reflections on our visit to Angel Island and Chinatown. Our collection of paper mache sea creatures we researched. 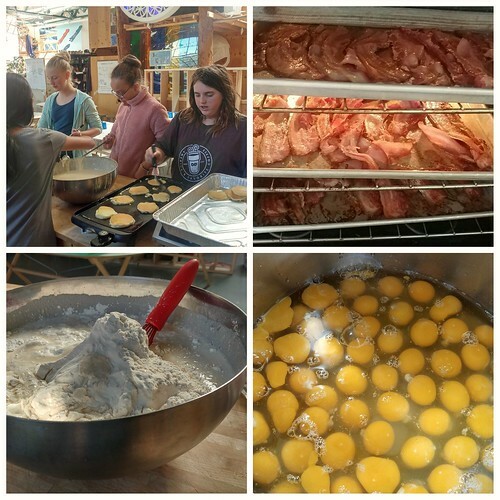 Making breakfast for lunch for Community Lunch. Delicious! This entry was posted in brightworks, Teal Band and tagged arc: By Sea, declarations, Expression. Bookmark the permalink.